Are you looking to host a vintage style hen party this autumn? With a cocktail making party, you can jazz up your party with a few of our top vintage cocktails! Although the mint julep is a classic cocktail us brits love to drink today, this American southern comfort cocktail was first created during the 1700s. This Kentucky drink is from Washington D.C in the famous Willard Hotel. “Julep” meaning sweet drink, was in fact primarily used as a medicine believe it or not. The mint julep is a ridiculously popular drink within southern America and has slowly become notorious to the rest of the world. Place mint leaves and mint simple syrup in a chilled julep cup. Gently press leaves against cup with back of bar spoon to release the minty aroma. Fill the cup as tightly as you can with crushed ice and then pour in the bourbon of your choice. Insert straw and garnish with mint sprig. It’s our top vintage cocktails you’re sure to love during your cocktail making class. This suave top vintage cocktails was given the name after Martinez, California in 1887. There is no denying that this drink is delicious, in fact it’s the perfect mix between the sweetness of the maraschino liqueur and the vermouth. If you love Gin based cocktails, then don’t miss out on this vintage delight. Both easy and quick to make, making it the perfect drink to try at your cocktail making hen party. Let’s take a trip to France with this top vintage cocktails. The “Bijour” which translates to “jewel” in English is a boutique style cocktail in 1900 by a bartender named Harry Johnson’s. Although there isn’t much history of this cocktail found, this delicious drink is still one of our found favourites. Again, this cocktail is for our Gin loving hens who are looking to make something a little sweeter. Having a night out with your hen party may seem like a good idea at first, a few drinks with the hens at our cocktail making party or a quiet one at the bar. But before you know it, it’s one of those mornings where getting out of your bed feels like the toughest task you’ve ever had to achieve. But that’s what were here for, these are our favourite hangover cures that can make your post-night out symptoms less severe. As you know (if you can remember) when drinking on a night out you tend to venture to the loo more often than normal. Water is a must when it comes to curing a hangover. Alcohol can dehydrate your body of fluids so before you fall into your bed you should drink a glass of water. The more water you drink the more fluid there is to replace the alcohol and the better you will feel. So before ordering another vodka maybe order a glass of water, you’ll thank us in the morning. Remember as a kid when your mum would make you eat toast when you’d had an upset tummy, well this advice is perfect for now too. Toast or crackers can be a lifesaver for if you can’t keep food down. By eating a few pieces of toast or crackers it will raise your blood sugar levels. If you’ve been drinking one too many your liver is working overtime to process everything so your sugar levels stay down which is why you’re tired and irritable. It also helps soak up all of the night before left in your stomach. Who would’ve thought our mums were talking sense all along? Although toast and crackers will help the morning after it’s all about what you eat before your 2 for 1 cocktails. Though you may be craving the greasy foods in the taxi ride home and would do anything for some chicken nuggets it’s all about eating them before. By eating foods with high-fat before going out you reduce your risk of a hangover as the fats line your stomach. If you’re healthier than a trip to the local fast food restaurant, then try eating high-carb foods like rice and pasta. From lining your stomach, it helps slow the absorption of alcohol throughout the night making you feel better the following morning. Do you even have a hangover if your head isn’t pounding?? To ease your head try using things such as anti-inflammatory drugs or non-steroidal anti-inflammatories such as aspirin, ibuprofen or naproxen. Try to avoid things like Tylenol and paracetamol as although there ideal for headaches when you’ve got an over working liver due to your alcohol intake they would probably do more damage than good. According to research sleeping helps you get over your hangover as it gives your liver a longer time to scrub down your system of all the alcohol you’ve poured into yourself from the night before. Especially since you probably didn’t get a decent night’s sleep from continuous trips to the loo along with your odd sips of water. If you aren’t going to have a productive day you may as well accept defeat of your hangover and sleep to get back on form. If All Else Fails, Sunglass It Up! This is the typical last resort of our favourite hangover cures but everyone does it! Some can’t stay in bed in their sweats all day recovering from the previous night, cringing as you slowly remember everything. Some actually have to experience the painful venture outside. Along with the usual joys of a hangover you may find yourself sensitive to bright lights which is where sunglasses come in. Nobody would even suspect anything so long as it isn’t raining. Obviously none of these are going to perform miracles, but these are our very effective tips on saving and preventing you from the hangovers everyone always dreads the morning after. 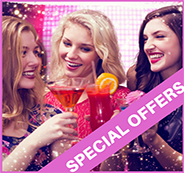 You’ve decided to throw your hen party at home but on a tight budget? No worries at all! Here are a few tips and tricks to your decorations on a budget. You can still change your pad into a stylish party venue by finding things cheap as chips. These decorations are sure to make your mobile cocktail making party look amazing! First things first, if you’re a bridesmaid planning, then make sure to check with the bride that she wants decorations. You probably already know the answer to this but there’s no harm in double checking. Secondly, decide on a theme. Make sure to tie everything in together so it doesn’t look odd. There is a never-ending list of themes, it goes on and on and… you get my drift. But I do advise that you should base it on the activity you have chosen, even if it’s just a colour theme or costumes. This will make it easier for you to plan and it’ll look much better in the end. If you DIY your decorations you’re sure to save some serious amount of money. There are plenty of classic and cool decorations you can make yourself. When you put your mind to it you can seriously come up with and create some amazing things. Which is great for those looking for decorations on a budget. I found some glam and unique ideas that you could possibly use. Food and drink is important if need be. If you’re catering for a large group, the price for food adds up. However, there are plenty of tasty treats you can make and with little ingredients. If you search hard enough, you can find some incredible food and drink ideas which will make your hen party that little bit more special. There are loads of things you could make such as a ‘pimp my prosecco’ station, chocolate strawberry shots, magic mike cookies and many, many more.